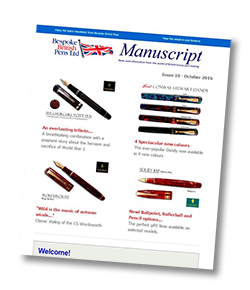 Register here to receive your regular copy of ‘Manuscript’, the Bespoke British Pen company’s newsletter. It will keep you up to date with all the latest news from the world of British luxury pen-making as well as giving you the opportunity to purchase special editions. Just enter your details (right) and we will email ‘Manuscript’ to you. It’s packed full of interesting and informative facts and features about the finest British luxury pens. It’s completely free of charge and you can unsubscribe at any time.